When I hear a professor from MIT saying she knows how to fight poverty, my first reaction is that of skepticism. “Does she even know what poverty is?” That’s how my mind would respond. And yet when I heard the TED talk by Prof. Esther Duflo of MIT titled “Social experiments to fight poverty”, I was thoroughly impressed. It took me some time to understand what exactly in the talk that impressed me so much. Subsequently I bought the book “Poor Economics” which she co-wrote with Abhijit Banerjee. 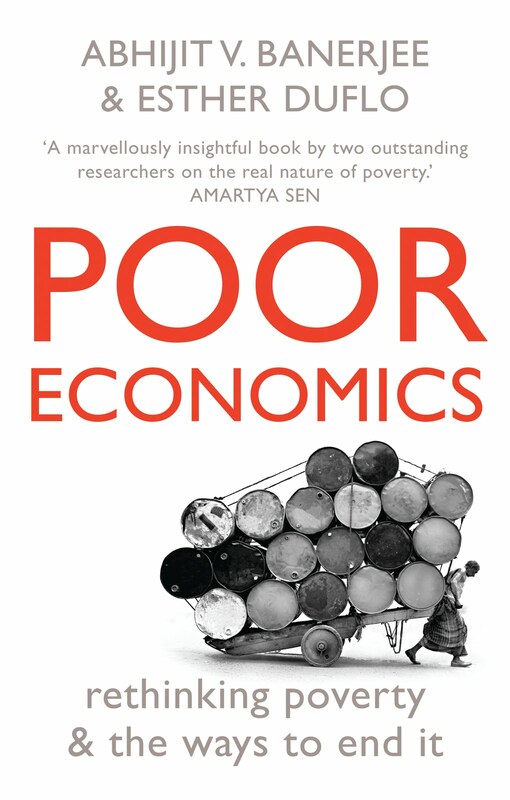 Now, I am slowly beginning to understand why Amartya Sen has said, “A marvelously insightful book by two outstanding researchers on the real nature of poverty”. In this article I want to highlight three things that I find interesting in the book. Intractable problem, manageable sub-problems: Poverty eradication looks like an unsolvable problem. People from Karl Marx to Mahatma Gandhi have taken a shot at it. However, it is not clear whether we have a handle on it. Silver bullet approach like “give aids” is not helping. Banerjee-Duflo take a different view. They feel that instead of trying to answer the top question, why not look at some sub-problems – each of which might have a definite and practical solution. For example, in the talk, Duflo presents three such sub-problems: How can we have more kids immunized? How can we get more people to use bednets that can reduce malaria affliction? How can we get students to attend school more number of days for a given dollar spent on the cause? The book, like the talk, shows how we can go about systematically addressing these sub-problems. Randomized experimentation: Let’s take the question of immunization. In Udaipur district of Rajasthan, it was found out that only 1% of the children are fully immunized. The vaccines are there and are available for free. It is not that the parents don’t care about their kids. When their kids get measles parents end up spending thousands of rupees in treatment. So you have empty village sub-centres on one hand, and crowded hospitals on the other hand. So looks like the intention is not translating into action. What do you do? Dulfo & team decided to try random trials in 134 villages in Udaipur district. For one third villages there was no change, another one third villages had immunization monthly camps conducted and the last one third had camp plus a kilo of lentil free for camp participant. As it turned out the immunization percentage jumped by a whopping 37%. Note that this approach is analogous to randomized control trials used in medicine to discover drugs. Design as if implementation matters: The beauty of Banerjee-Duflo approach is not that it does not make any assumption about the culture, anxiety, aspirations of the poor. The experiments reveal their biases anyway. I call this approach of designing an intervention – design as if implementation matters. Note that the approach does not advocate laboratory experiments – the experiments are performed in-field in actual conditions. I feel that experimentation and immersive research are the heart and the soul of systematic innovation. Banerjee-Duflo approach epitomizes both. Now, I know why the TED talk struck such a chord with me. I strongly recommend the book for every student of social innovation. "He [Maganlal] was, in my opinion, a genius... He laid the foundation of the science of Khadi by writing his Vanat Shastra” said Mahatma Gandhi at the inaugural ceremony of Magan Museum of Khadi (pdf) at Wardha on Dec 30, 19382. Ever since I read this, I became curious about Maganlal Gandhi. Where did Maganlal learn the science of khadi? Was this science backed up by rigorous experiments? If so, where did Maganlal perform those experiments? I wanted to find out. Finally, I got a peek into the story when my friend Prof. Rishikesha Krishnan connected me to Prof. Shambu Prasad of XIMB Bhubaneswar. Shambu has done extensive research on science of Gandhi. I found answers to some of my questions in an excellent article written by Shambu “Gandhi and Maganlal: Khadi science and the Gandhian scientist”. Here is a short summary. Maganlal Khushalchand Gandhi (1883-1928) was Gandhi’s nephew (a grandson of his uncle) and 19 years younger to him. Maganlal met Gandhi in 1902, two days before Gandhi was to leave for South Africa. Maganlal was then on the lookout for a job in his native Kathiawar. Gandhi asked Maganlal to come to South Africa offering it as a land of opportunities with ample scope for growth. Maganlal was immediately put into business and was running a family shop of the Gandhis. When Gandhi quit his practice and decided to set-up a farm and take to farming as an occupation, Maganlal was the first to join him unconditionally knowing it involves self-imposed poverty. In a short time, Maganlal picked up several skills at Phoenix Farm - composing and running the machines in the press, farming, carpentry and tailoring, keeping accounts of the settlement and teaching the children Gujarati and Mathematics. It was Maganlal who suggested the name Sadagraha to Gandhiji when he solicited a better term for “passive resistance” in the local newspaper Indian Opinion. Gandhi later modified Sadagraha to Satyagraha. Later in India, Maganlal set-up and ran the khadi laboratory at Sabarmati Ashram as he was the head of the Technical Department of the All India Khadi Board (later the All India Spinners Association). Maganlal traveled to Madras Presidency to learn the art. The technical department of the Ashram, tested several samples of yarn (over 300 every month) and gave feedback to the Provincial Congress Committees. These results were widely reported regularly in Young India and Navjivan. As a resource centre in the field of khadi the Ashram used to send its staff, spindles, specimens of yarn, and charts explaining the effect of the wheel to exhibitions all over the country. Gandhi relied on Maganlal to test the various machines and always wanted Maganlal’s opinion on technical developments whether it was Mirabehn’s discovery of the soft spindle, Shankarlal’s Gandiva spinning wheel or the Ramachandra lift pump. In 1922, a ‘Khaddar Information Bureau’ was constituted to provide or collect information on khadi from the provinces, to inform congress committees and selected workers on reports from the centres. Maganlal edited its ‘Khadi Bulletin’. A syllabus was formulated in 1923 for the weaving school with a regular six-month course. A khaddar service scheme was also instituted under which 600 instructors were to be trained in home carding. 2. “Mahatma: Life of Mohandas Gandhi” by D. G. Tendulkar, volume 5, page 6. 3. Maganlal’s photo is from "Magan Nivas" at Sabarmati Ashram.